This is No. 3 in an occasional series on combines. When completed, the series will span the 63 years that I have spent running combines. Some years just a few hours, but a bit in each of the years. The first piece included a bit about a Case K2 combine. I did not have an original photo of that combine. Colleague Brian Rossnagel sent me a photo of him running the Case K2 on the Plumas, Man., farm where he was raised (see below). Many will remember Brian as a prominent barley and oat breeder at University of Saskatchewan, now retired. Photo 1: Brian Rossnagel on a Case K12 combine. Brian also sent an interesting story about that combine. As a rammy teenager, he came bouncing into the farmyard in road gear and had an unscheduled meeting with the yard power pole. The unloading auger was on the wrong side on that combine and the yard pole won. Oops. Father not too happy. They fixed it and back to work. But then his Dad pulled the same trick in the field with a corner power pole, but at a slower speed. Thanks Brian for the photo and the story. I suspect there are other Case K12 owners with similar stories. Time for some green paint. The first John Deere combine I remember is the 55 self-propelled. My brother-in-law at Milden had a JD 55. The steering wheel was vertical and many combined standing up. He and a neighbour took turns on the combine. To change operators, they would run up and down the ladder while the combine kept going. That was way before auto steer, but combines then did not do five mph either. 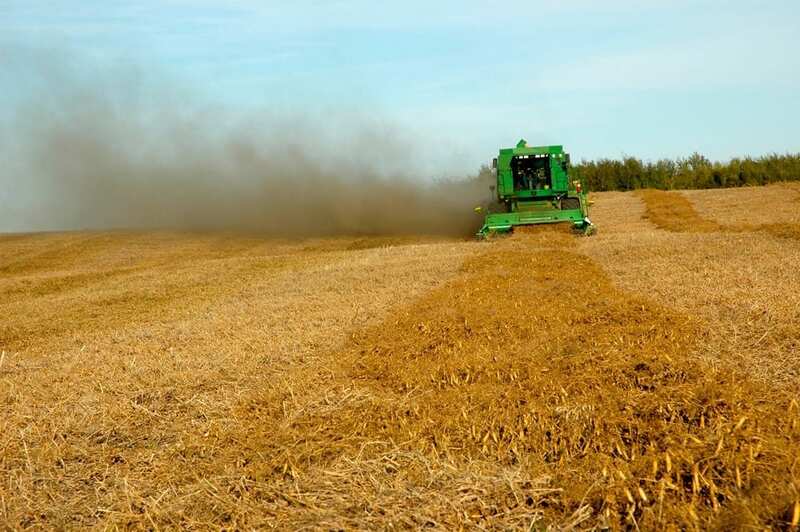 Long time Grainews columnist and southern Alberta farmer Lyle Walker did a series on combines in the 1980s. In the March 25, 1985 issue of Grainews he told the whole story about the 55. He said that from 1947 to 1969 John Deere built 90,000 of those machines. Lyle claimed this was a record that would probably stand forever. We asked Grainews machinery editor if the record has been broken since, but Scott pointed out that manufacturers don’t like to reveal their production numbers. When I was on the Tanzania/Canada wheat project on the slopes of Mt. Kilimanjaro in Tanzania from 1972 to 1974 I had a chance to run a JD 630 combine sent from Europe. It had a four-row corn header and it was my pleasure to rub out a few hoppers of corn. The corn plants were down on parts of the field, so helpers manually piled up the cobs. I would take the combine to a cob pile and they tossed in the cobs. Just sit there and watch the hopper fill in no time. That is the only corn I ever combined. It was fun! 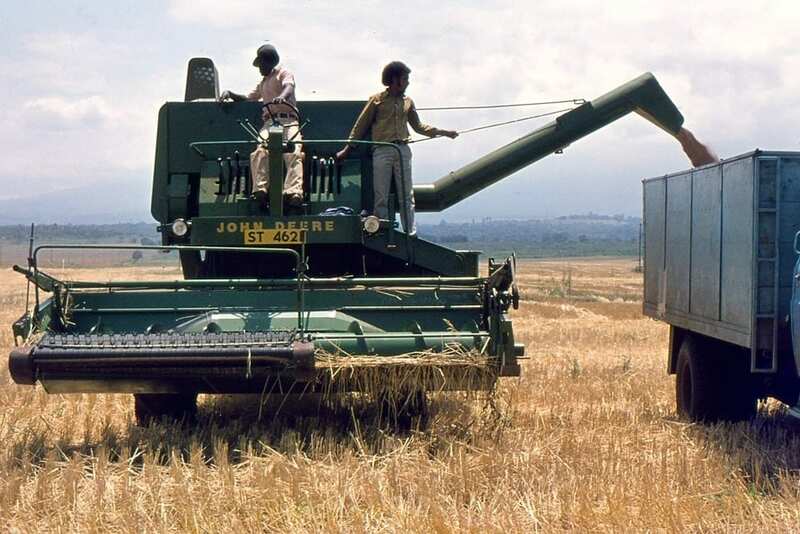 Photo 2: The John Deere 630 combine in Tanzania, 1973. The large upland in the background is Mt Kilimanjaro, with an elevation of 19,340 feet. Photo 2 (above) shows Peter at the controls and Mohammed watching the wheat being augered to the lorry on that JD 630. 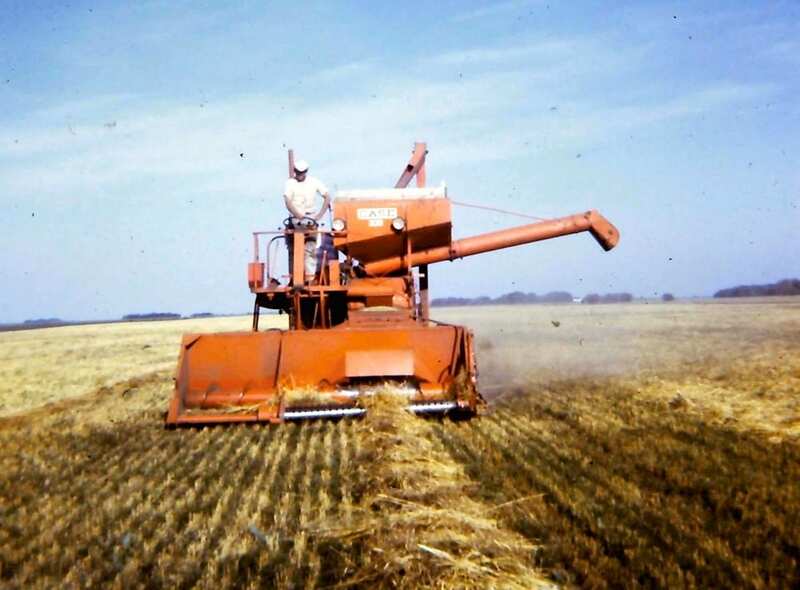 The combine was equipped with a very light belt pickup that would work fine in 80-bushel crops in Europe but was not much good trying to pick up the 20-bushel Tanzanian crop in that dry year. The JD 630 in Photo 3 (below) is with a bagger attachment that was used in the 1970s in Tanzania. The bags of wheat weighed 200 pounds and it took lots of manpower to hoist them from the ground to the transport wagon. 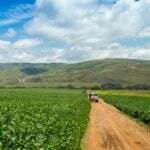 This photo was taken on the Basotu Wheat Plantation in western Tanzania. Photo 3: Another JD 630 at Basotu Wheat Plantation, Tanzania (1974). On my Dundurn farm, renter Allan Olson had a JD 7700 that I ran for a few short days. 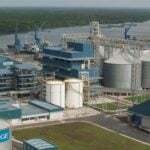 More capacity but still quite basic with conventional cylinder. Plugging the table auger or cylinder still meant a big manual job. My most memorable time on a JD was a winter combining (November) exercise with my nephew Terry Gates at Nipawin in the 1990s. It was a JD 8820 which had a few bells and whistles. It was possible to reverse the header auger to unplug but it was a bit of a foot trick and not easy. 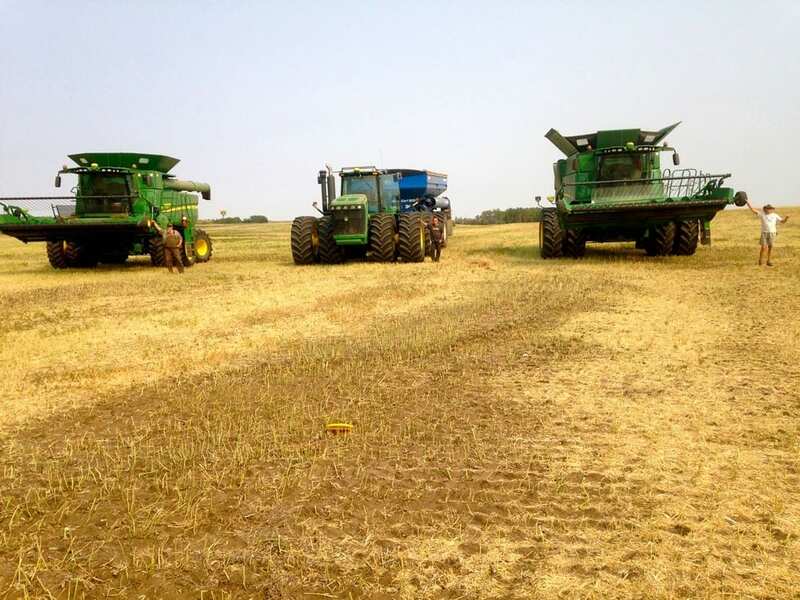 We were combining barley that was so tough that I got a scolding for piling it too high on the tandem, so the driver could not get the tarp on easily. It all went straight to a dryer. Winter combining is not fun. Good neighbour Henry Block (1940-2011) combined my 57 bushel/acre pea crop in 2005 with his JD 9650 (Photo 4 below). By that time combines were modern rotor combines with joy sticks and many automatic features that made them a joy to run. It has been my thrill over the years to run most of them for at least a few hours. Photo 4: Neighbour Henry Block combined my 57 bushel/acre pea crop in 2005 with his JD 9650. 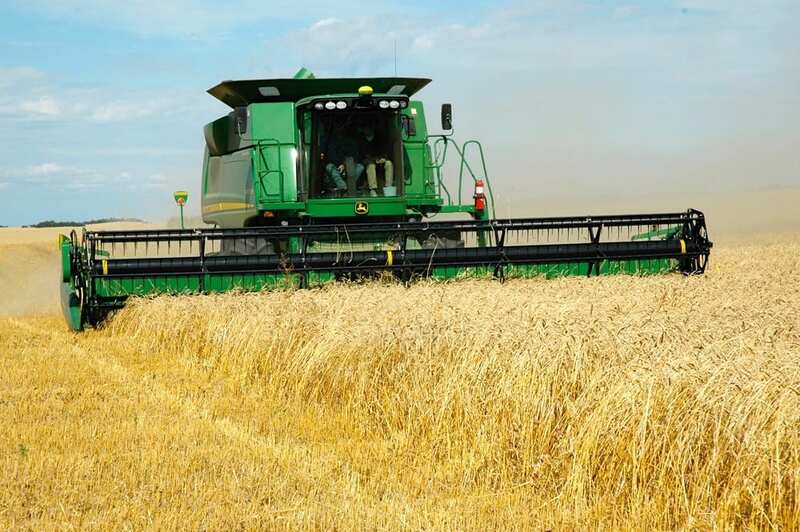 That combine had an early version of a flex header. It had some bugs, but without that my 20-bushel wheat crop of 2002 would have been a 15-bushel crop. My most memorable year with that combine was a tag team affair with Henry Block and I. We were picking up swathed canola. I filled the three-ton and then took it off to the yard to dump. Henry then filled the tandem and dumped it. Not high productivity but there was not much left and good weather so it was a lot of fun. The first morning I showed up for duty on a quarter section near Blackstrap valley Henry jumped off the combine and into my pickup and told me to drive towards the valley. Standing there like a king was a huge, old, grey-haired buck with a large rack. Henry had been watching him for years. When the guns started to bang each year he quickly ran for shelter in the adjacent Blackstrap Provincial Park. That is why he lived to be an old, grey-haired buck! 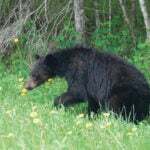 City slickers think that farmers have no time for wildlife. They should come to my Dundurn farm and we can show them deer, moose, hawks, ducks and geese to no end, coyotes, fox and more. The only thing not welcome on my farm are raccoons and mice. And rats of course, but we have no rats now. All of these modern JD combines are great machines and easy to operate. But all machines have a soft spot or two. I was running the 9650 when a bad noise warned of trouble: perhaps a rock banging its way through. A stop to check found that the feeder chain had packed it in. On the 9770 the accelerator can dead jam with no notice. Quick action is required or a belt is sacrificed. That happened to me twice. The first time cost a belt. The second time I was quick enough to save the belt. The S series also suffer from accelerator issues. 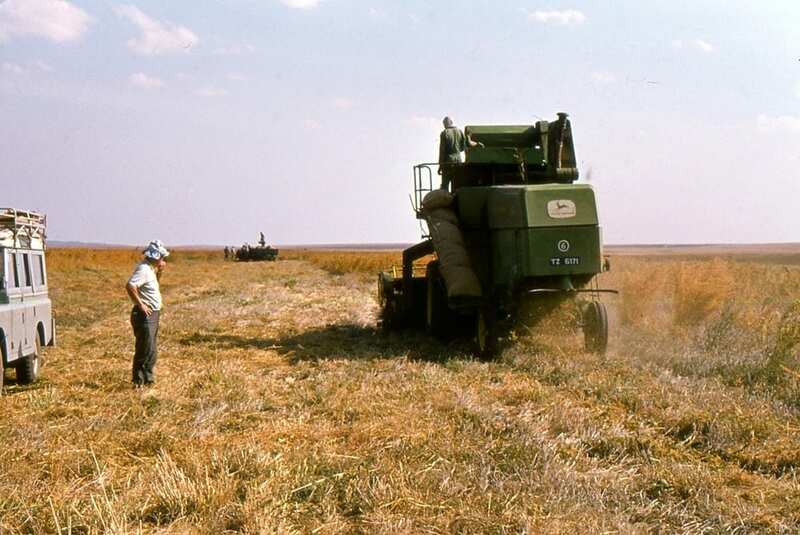 Photo 5: In 2008 the Block Farm’s JD 9770 cuts my 40-bushel wheat crop. On the newest combines the re-thresher seems to be a trouble maker but I have not been operating when that happened. I remember re-threshers on old 21 Masseys but I never did run one. Increasingly, problems that stop a machine have nothing to do with how the thing threshes or separates grain but rather the plethora of bells and whistles that make noise and lights flash to say there is a problem – i.e. computer problems. Those are the most frustrating and often require a visit or phone call to a geek from the dealer to solve the issue. But, the thrill of the harvest continues unabated as newer, bigger and better machines come along to get the harvest done in the time Mother Nature allows — always an unknown quantity. By the time you read this I hope your 2018 harvest is history. But with the cards Mother Nature is playing in mid September many of you will still be slaving away. Keep safe! J.L. (Les) Henry is a former professor and extension specialist at the University of Saskatchewan. He farms at Dundurn, Sask. He recently finished a second printing of “Henry’s Handbook of Soil and Water,” a book that mixes the basics and practical aspects of soil, fertilizer and farming. Les will cover the shipping and GST for “Grainews” readers. 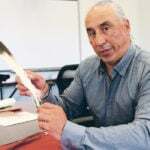 Simply send a cheque for $50 to Henry Perspectives, 143 Tucker Cres., Saskatoon, Sask., S7H 3H7, and he will dispatch a signed book.